Electric bikes are the famous E-bikes that are nothing but the usual bicycle with an electric motor that helps the speed in pedaling. This assists the user in pedaling faster or further, when the user might find it difficult at times like riding uphill or travelling longer distances. With the bursting number of electric bikes available in the market, often one thinks the need for electric bike. There are numerous advantages over the normal bikes. Let’s discuss on the benefits of the electric bikes. Reduce Fuel Expenses: Cost of the gas and the daily public transport costs are increasing steadily. The assisted cycling or ebikes saves us lot of bucks when used in the longer run. The expense of bike is little more than the normal bikes, but definitely the energy and expense of the bike is less compared to the car or moped. The electric bikes run on the electrically charged batteries. So they don’t emit any kind of gases into the surrounding air. This makes the ebikes excellent choice when one is conscious about the increasing pollution in the air. Cycling to Work: It’s a great idea to cycle to work, as with the ebikes there is less sweating, as the effort can be minimized by the assisted cycling with the electric motors. The bicycle electric motors aids in travelling faster, when the cars are stuck in the traffic. The ebikes can just slide in and out of the traffic, reaching work earlier than the car owners. Fun with Cycling: From childhood, the one of the favorite ride ons are cycles that starts with tricycle and then to bicycle. It’s always fun to ride a cycle in our own pace by enjoying the surroundings. This is one of the advantages why people go on cycling to longer distance instead of using cars or other transportation modes. There are two types of electric bikes that differ in the way the motors are controlled. Throttle Type: The throttle type ebikes are the bikes that can be controlled with the handlebar. The bikes can be switched on and off, the speed can also be adjusted. Some of the throttle types can also be pedal assisted. Pedal Assisted: The pedal assisted bikes are not throttle type, the motors are not controlled directly. This is directly based on the strength applied to the pedals. The higher end models have a technique called as “torque sensing pedelec”. These bikes sense the power applied to the pedals and adds the additional power so that eases the rider. With the wide range of the electric bikes available in the market, there is one bike that particularly stands out from the rest of the bike. The ProdecoTech Oasis is a long waited ProdecoTech ebike. The bike is affordable for the riders, even though the qualities of the features are high. Even the price of bicycle electric motor is low. The look and feel of this ebike is solid and at the same time it’s cool. The younger generation would love to own this ebike for the color. This ProdecoTech Oasis ebike comes in only one size and one color. They have an adjustable seat and an adjustable handlebar. Both can be adjusted to the rider’s height and preference. This electric bike also comes the “torque sensing pedelec” as an upgrade. This can be attached to the bike and plugged into the controller. Affordable Price: The price of the ProdecoTech Oasis is very affordable for the riders. It’s the fun budget oriented ebike. The price is so low, that they even refer it as street price. Power of Electric Motor: This ebike offers almost 750 watts of power in the gearless configuration. This makes the bike an excellent choice for the mountain rider who climbs the uphill. Durable Tires: The continental tires are large making it durable for any kind of bumpy and bouncy surfaces. The most suitable ebike for any kind of hard surfaces. Sturdy Pedals: The sturdy pedals of the ebike are durable. The pedal is wide enough making the pedaling so comfortable even for the very wide footed riders. Weighs Heavy: The electric motor of the bike weighs so heavy, as it depends on the big magnets to create more power. Lack of Regenerative Braking System: Other gearless ebikes offer this advanced technology of regenerative Breaking system, which handles the smooth braking system for the ebikes with good power. Low Suspension: The larger tires helps in smooth ride but this bike has low suspension which makes it bumpier. It might also affect battery. Variety less: This is just available in only one size and one color, which makes the ebike less interesting. Absence of Display Control: There is no display control in order to keep track of the distance covered or speed. Even there is no display about how much battery has been used or how long the ebike can run. 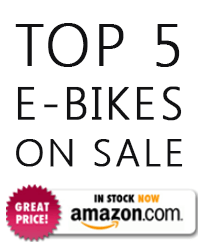 Astonishingly Cheap: No other ebike is so cheap compared to its amazing features. Its priced around $1800, making the price of bicycle electric bike motor very cheap. ProdecoTech Oasis is the best combination of quality and price. Flexible Charging: Removable battery makes the life so easier for the riders, that they can just remove it and charge it in the home and again connect it back. On the other hand, the attached battery needs constant checking on their charging. Even it can be charged while at work. Warranty for 2 Years: This ebike comes with the warranty of 2 years except for the battery wear outs. This makes it easier for any new ebike rider to get used to the electric pedaling and motor. Rear light: A rear light is attached to the rear of the battery in this electric bike. This provides the bike a basic level of safety. Choosing the best suited electric bike is the toughest task, considering the wide range of brands and manufacturers available. But to start with, the rider should focus on his purpose for the ebike like to go to shops for a quick shopping near to home, for sporting purposes like biking, mountain climbing or even to work. Some of the countries like UK encourage cyclist by having schemes that would cover the buying cost of cycle partially. Environmental pollution can be decreased with the regular use of cycle to work and with the good health. Once decided, the next important factor is cost of the electric bike. Apart from the purpose and cost, the other factors to be considered are weight, battery life, warranty and availability of the spare parts in case of any issues. By validating all the possible factors, the ProdecoTech Oasis is the best quality electric bike with cheap bicycle electric motor making the bike affordable along with good battery life. The warranty period of 2 years is an added bonus. On the whole, ProdecoTech Oasis is a great electric bike to own. 1.5 9 Reviews ProdecoTech Oasis 48V 750W 8 Speed Electric... Aircraft Grade T6 Aluminum AlloyProdeco 48V 750W HO Brushless Direct Drive w/Disc Mount MotorSRAM X7 Twist Grip 8 Speed Shifter PRICE & MORE DETAILS!